Lenovo XClarity™ Administrator is a centralized resource management solution that is aimed at reducing complexity, speeding response, and enhancing the availability of Lenovo® server systems and solutions. This product guide provides essential presales information to understand the Lenovo XClarity Administrator offering and its key features, specifications, and compatibility. This guide is intended for technical specialists, sales specialists, sales engineers, IT architects, and other IT professionals who want to learn more about Lenovo XClarity Administrator and consider its use in IT solutions. Lenovo XClarity™ Administrator is a centralized resource management solution that is aimed at reducing complexity, speeding response, and enhancing the availability of Lenovo® server systems and solutions. Lenovo XClarity Administrator provides agent-free hardware management for our servers, storage, network switches, hyperconverged and ThinkAgile solutions. Migrating from v1.x.x? For information on migrating to XClarity Administrator v2.1.x from a previous release (1.x.x) please refer to the Lenovo XClarity Administrator Quick Start Guide. Tip: If running a version of XClarity v1.x.x you must update to v1.4.1 then you must migrate your system to v2.0.0 then upgrade to v2.1.0. Lenovo XClarity offers a mobile app for Android and iOS devices. The app enables you to securely monitor physical systems, get real-time status alerts and notifications, and take action on common system level tasks. The app can also connect directly via an enabled USB port to a ThinkSystem server and provide virtual LCD capability. The XClarity Administrator dashboard is an HTML 5-based web interface that allows fast location of resources so tasks can be run quickly. Because Lenovo XClarity Administrator does not include any agent software that is installed on the managed endpoints, there are no CPU cycles spent on agent execution and no memory is used, which means that up to 1GB of RAM and 1 - 2% CPU usage is saved, compared to a typical managed system where an agent is required. Fast time to value is realized through automatic discovery of existing or new Lenovo rack servers and Flex System infrastructure. Inventory of the discovered endpoints is gathered, so the managed hardware inventory and its status can be viewed-at-a-glance. A centralized view of events and alerts that are generated from managed endpoints is available. When an issue is detected by a managed endpoint, an event is passed to Lenovo XClarity Administrator. 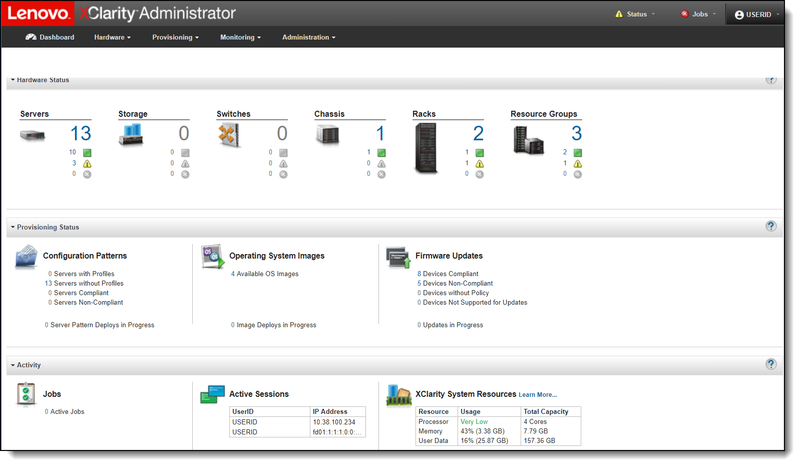 Alerts and events are visible via the XClarity Administrator Dashboard, the Status bar, and the Alerts and Events detail for the specific system. Firmware management is simplified by assigning Firmware-compliance policies to supported managed endpoints to ensure that firmware on those endpoints remains compliant. You can also create and edit firmware-compliance policies when validated firmware levels do not match the suggested predefined policies. Additionally you can also apply and activate firmware that is later than the currently installed firmware on a single managed endpoint or group of endpoints without using compliance policies. Starting with v2.1.0, XClarity Administrator utilizes Windows UpdateXpress System Packs (UXSPs) to enable the update of the OS device drivers on deployed Windows operating systems. Windows UXSPs contain Windows device drivers for supported Windows versions and for Lenovo servers that supports Windows. You can download or import Windows UXSPs in the repository. UXSPs must be available in the repository before you can update Windows device drivers on managed severs. Configuration management uses pattern-based configurations to quickly provision and re-provision a single server or multiple servers and compute nodes, all with a single set of configuration settings. Settings to configure include local storage, I/O adapters, boot order, and other baseboard management controller and UEFI settings on managed servers. Server patterns also integrate support for virtualizing I/O addresses, so you can virtualize server fabric connections or repurpose servers without disruption to the fabric. Additionally if the settings on a server change, you can determine the compliance status of each server from within the Configuration Patterns Server Profiles page. OS Provisioning enables bare metal deployment. VMware ESXi, Windows Server, SUSE Linux Enterprise Server (SLES) and Red Hat Linux images can be imported and held in a repository for images. A maximum of 10 Images can be stored within the repository and it is possible to deploy operating-system images to up to 28 bare-metal servers concurrently. When you manage Lenovo chassis and servers in XClarity Administrator, you can configure XClarity Administrator to change the firewall rules for the devices so that incoming requests are accepted only from XClarity Administrator. This is referred to as encapsulation. If you must be compliant with NIST SP 800-131A or FIPS 140-2, XClarity Administrator can help you meet that compliance. XClarity Administrator supports self-signed SSL certificates (issued by an internal certificate authority) or external SSL certificates (private or commercial CA). When changing cryptographic settings within XClarity Administrator you can choose to apply the settings to the management server only, to the managed devices only, or both. XClarity Administrator includes an audit log that provides a historical record of user actions, such as logging on, creating users, or changing user passwords. XClarity Administrator can be integrated into external, higher level management, automation, and orchestration platforms through open REST application programming interfaces (APIs). This means Lenovo XClarity can easily integrate with your existing management infrastructure. Lenovo XClarity integrates with leading management applications in the areas of infrastructure management, orchestration and automation, and IT service management. Note: XClarity Administrator integrates with PagerDuty without additional software. The Lenovo Physical Infrastructure Provider provides IT administrators the ability to integrate the management features of Lenovo XClarity Administrator with the hybrid-cloud management capabilities of Red Hat CloudForms. Lenovo XClarity Integrator for Nagios retrieves alerts from XClarity Administrator, and makes them available to Nagios. Lenovo XClarity Essentials Plug-in for Nagios is a stand-alone plugin for Nagios that retrieves health status from individual Lenovo ThinkSystem servers. Ordering information for those integrators requiring a license is described in the Download and ordering information section. This download provides Lenovo XClarity Administrator base functionality plus a 90-day trial evaluation Licenses for XClarity Administrator features Configuration Patterns and Operating System Deployment. Note: Service and Support for XClarity Administrator and XClarity Integrators is only available with an XClarity Pro purchase. The following table compares XClarity and XClarity Pro. Forward emails to share inventory, alert and event information. On ThinkSystem servers: Perform initial configuration of servers, retrieve diagnostic information (virtual LCD) and perform actions, Initiate Lenovo XClarity Administrator management from a mobile device. Supports Android 5 to 8, and iOS 10 and 11. Requires Lenovo XClarity Administrator v1.2.1 or later. iOS 8 is supported only for Lenovo XClarity Mobile v1.3.0 and earlier. iOS 9 is supported only for Lenovo XClarity Mobile v1.3.1 and earlier. The following figure shows the Inventory screen of the mobile app. By using Lenovo XClarity, users can perform the following tasks that are described in this section. Lenovo XClarity Administrator provides a centralized authentication server to create and manage all user accounts and to manage and authenticate user credentials. 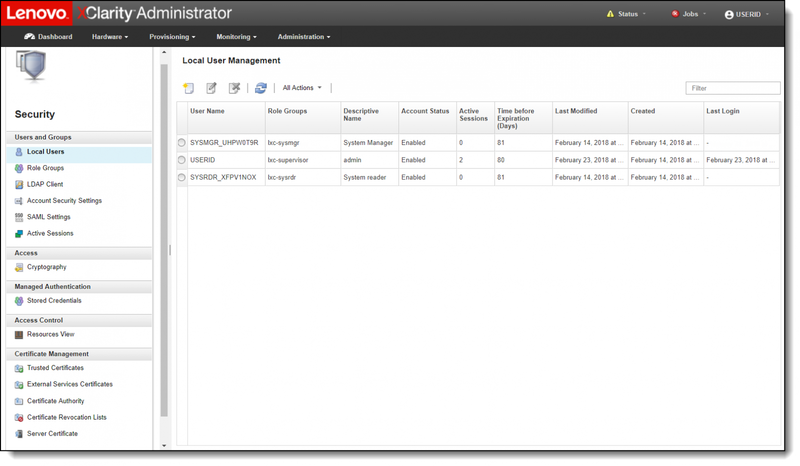 The authentication server is created automatically when the management server first starts. The User accounts, which are used to log on and manage the Lenovo XClarity Administrator, are also used for all chassis and servers that are managed by the Lenovo XClarity Administrator. When you create a user account, you control the level of access, such as whether the account has read/write authority or read-only authority, by using role groups. When devices are initially managed by Lenovo XClarity Administrator, a predefined set of role groups have permission to access the devices by default. This predefined set is empty by default until it is configured. You can change the role groups that can access specific managed devices. When permission is given to certain role groups, only users that are members of those role groups can see and act on those specific devices. By default, devices are managed using XClarity Administrator managed authentication to log in to the devices. When managing rack servers and Lenovo chassis, you can choose to use managed authentication or local authentication to log in to the devices. The following figure shows the Lenovo XClarity Administration interface for Security that comprises User Management, roles, and other security settings. 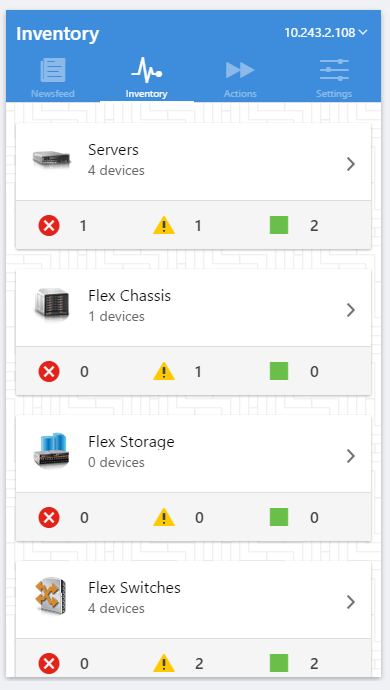 Lenovo XClarity Administrator provides a centralized view of events and alerts that are generated from managed endpoints, such as chassis, servers, and Flex System switches. When an issue is detected by the Chassis Management Module (CMM) or device that is installed in the chassis, an event is passed to the Lenovo XClarity Administrator. That event is displayed in the alerts list that is available within the user interface. A status bar also is available that provides overall status information on the main XClarity Administrator interface. An example list of alerts is shown in the following figure. There are various management tasks for each supported endpoint, including viewing status and properties, configuring system information and network settings, starting the CMM/IMM web interface, and remote control for the System x or Flex system node. The interface with a single System x Server selected and the power actions is shown in the following figure. Configuration patterns provide a way to ensure that you have consistent configurations applied to managed servers. Server patterns are used to provision or pre-provision a managed server by configuring local storage, I/O adapters, boot setting, firmware, ports, IMM, and UEFI settings. Server patterns also integrate support for virtualizing I/O addresses so you can virtualize Flex System fabric connections or re-purpose servers without disruption to the fabric. You can also determine whether the settings on a server are in compliance with the server profile. The settings on a server can become out of compliance with its server profile if settings are changed without using Configuration Patterns or if an issue occurred during deployment, such a firmware issue or an invalid setting. Lenovo XClarity Administrator can be used to manage the OS images repository and deploy operating system images to managed servers. To deploy an operating system image from Lenovo XClarity, at least one of the network interfaces (Eth0 or Eth1) must have IP network connectivity to the server network interface that is used to access the host operating system. It also must be configured with an IPv4 address. Additionally the Feature on Demand (FoD) key for remote presence is required on ThinkSystem, ThinkAgile Solutions, NeXtScale, and System x servers if not included as standard. Within Lenovo XClarity, you can manage the firmware updates repository and apply and activate firmware updates for all managed endpoints. Compliance policies can be started to flag managed endpoints that do not comply with the defined firmware rules. Refreshing the repository and downloading updates requires an Internet connection. If Lenovo XClarity has no Internet connection, you can manually import updates to the repository. The firmware apply and activate interface is shown in the following figure. XClarity Administrator offers a PyLXCA toolkit which provides a Python-based library of commands and APIs to automate provisioning and resource management from an OpenStack environment, such as Ansible or Puppet. Additionally, Lenovo now provides the Lenovo XClarity Ruby toolkit which is supported to automate resource management from an OpenStack environment, such as Ansible, Chef, or Puppet. The Ruby toolkit provides an interface to Lenovo XClarity Administrator REST APIs to automate functions (see Lenovo XClarity Administrator Ruby toolkit). The free download includes a 90-day evaluation license for Configuration Patterns and Operating System Deployment to allow you to evaluate these licensed components. Note: The free downloads do not include any entitlement for technical support. Lenovo XClarity Pro editions are available with a 1-year, 3-year, or 5-year software subscription and support. Lenovo XClarity Pro is available on a per-managed-server basis or per-managed-chassis basis. The per chassis licenses offer a more cost effective way of purchasing licenses for the Flex System environment. When you purchase XClarity Pro, the order is fulfilled via electronic software delivery (ESD) using the Lenovo Key Management System (LKMS). The order is placed onto LKMS using an email address for the end user who has ordered the code. This email address is where the Activation Code is sent in PDF format (the email will come from lkmsdev@lenovo.com). The recipient email address is the login to the LKMS system for administration and to manage the LKMS inventory. The part numbers for geographical regions are listed in the following tables. Lenovo XClarity Pro includes Lenovo XClarity Integrator for Microsoft System Center and Lenovo XClarity Integrator for VMware vCenter. For VMware, the virtual machine is available as an OVF template. For Hyper-V and Nutanix AHV, the virtual machine is a virtual-disk image (VHD). For KVM, the virtual machine is available as qcow2 format. Azure®, Hyper-V®, Microsoft®, PowerShell, Windows Server®, and Windows® are trademarks of Microsoft Corporation in the United States, other countries, or both.